Worried that dropping temperatures and a little snow will shut down your outdoor fun? These national parks prove winter really can be the most wonderful time of the year. It’s tempting to spend winter holed up inside—but you’d be doing yourself a disservice by spending these shorter, colder days hibernating…After all, that’s likely what everyone else is doing, giving you the opportunity to see some of America’s most beautiful national parks without the swarm of tourists you’d find in warmer months. 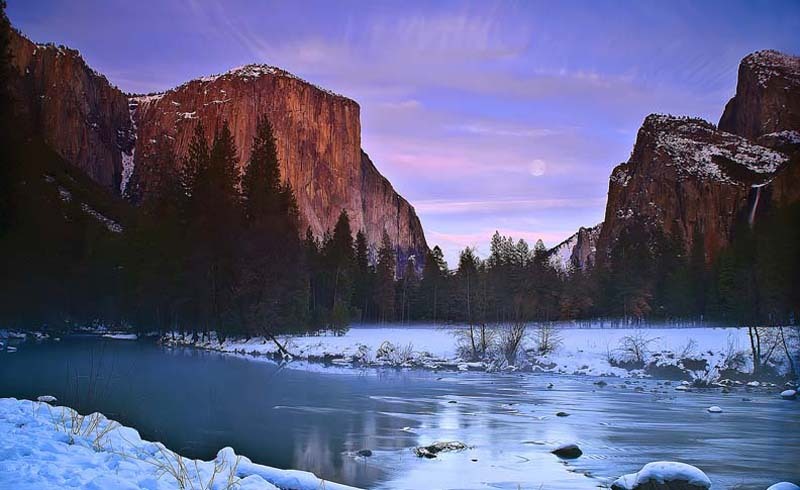 The tranquil solitude of the snowy trails, vistas, and backcountry will give a whole new meaning to “winter wonderland.” Here are the top five national parks to visit this winter (plus one warm weather bonus). Because most people flock to Colorado, Utah, and Wyoming for ski season, the prime backcountry of Acadia is a perfect place to have the slopes to yourself. The coastal drive along the east coast to Acadia is scenic in its own regard, with ice and snow blanketing the shoreline, forests, and the highest point on the North Atlantic seaboard, Cadillac Mountain. The park offers opportunities for ice fishing, dogsledding, cross country skiing, hiking, and a 27-mile (43.5 km) road system for snowmobiling. Mount Rainier and the park surrounding it become picture-perfect under the average 54 feet (16.5 m) of snow it receives each year. The 14,410-foot (4329 m) mountain is the most heavily glaciated in the US, and is also an active volcano, making it an exciting peak to summit. The park is open seven days a week, so climbing expeditions or sledding ventures in the designated snow play area are always possibilities. Rainier offers almost any outdoor activity you could think of, from ranger-guided snowshoe hikes to winter camping. It’s hard to believe, when you see Yosemite blanketed in snow, that it has fallen victim to some of the worst wildfires in the country. 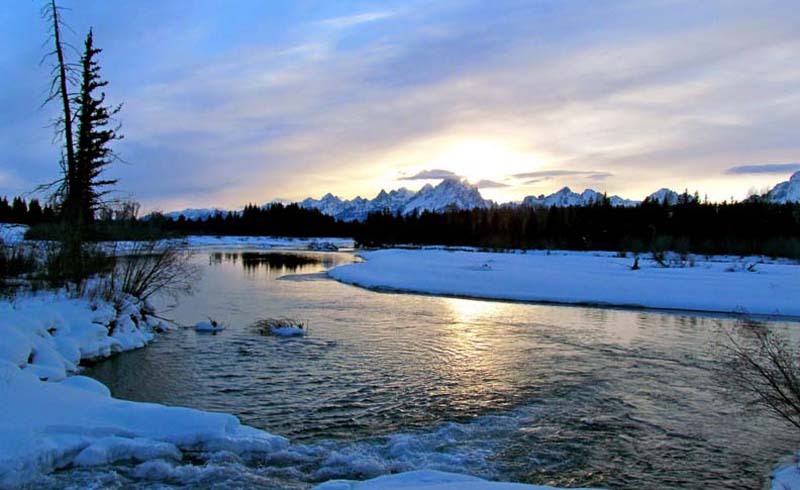 The frozen streams, foggy rivers, snow-capped mountains, and icicled waterfalls are truly stunning. To add to the magic of the snowy High Sierras, visitors can go ice-skating at the outdoor Curry Village Ice Rink, tucked beneath the iconic Half Dome. If you would rather spend your time in the backcountry, you can ice fish at the Merced River or ski and snowboard at Badger Pass. To see one of the natural wonders of the world is undoubtedly awe-inspiring. But to see the Grand Canyon’s red rock and deep ridges dusted with snow is to see the wonder in a whole new light—not to mention without the majority of the park’s five million annual visitors crowding the views. The snow clouds burn off quickly in the Southwestern afternoon sun, lighting up the canyon and giving you opportunities to hike the iconic South Rim without feeling a winter chill. With the tallest summits in the country—more than 60 mountain peaks reach above 12,000 feet (3657 m)—Rocky Mountain National Park is the place to go for majestic mountain vistas. Moraine Park, Longs Peak, and Timber Creek are open for campers year-round, making it one of the only parks to offer backcountry winter camping. Colorado is a cold-weather haven for snow fanatics, with the skiing opportunities being the obvious draw to Colorado. The intercontinental divide in Rocky Mountain National Park offers unforgettable terrain and incredible views of the nighttime sky. For adventurers who just can’t take the cold, or happen to be in a warmer neck of the woods, there are still opportunities for you to make the most out of winter—without the frigid temperatures. Everglades National Park offers some of the best wildlife sightings during these months, and the humidity and temperature are pleasant compared to the hot summer. Migratory birds from across the country settle in the Everglades during the winter season, making it one of the best bird watching opportunities in the world.